Years ago I started collecting heart shaped stones with my kids from a nearby river (Dad pays a buck for each stone!). In my studio I played with incorporating them into my work, as I loved the duality of their symbolism – the lightness of heart coupled with the heavy, solidity of the earth. Wrapping them in raffia and suspending them gave me an interesting visual. And I began contemplating the connection between the spiritual and physical as I often do. I had recently read a book by Carolyn Myss called Sacred Contracts. It discusses how, prior to incarnation, we make contracts with ourselves and others to accomplish certain things in a given lifetime. So I added the scroll as a symbol of our contracts. The jewel represents our unique identity. The curtain background is the ‘stage’ of human experience. 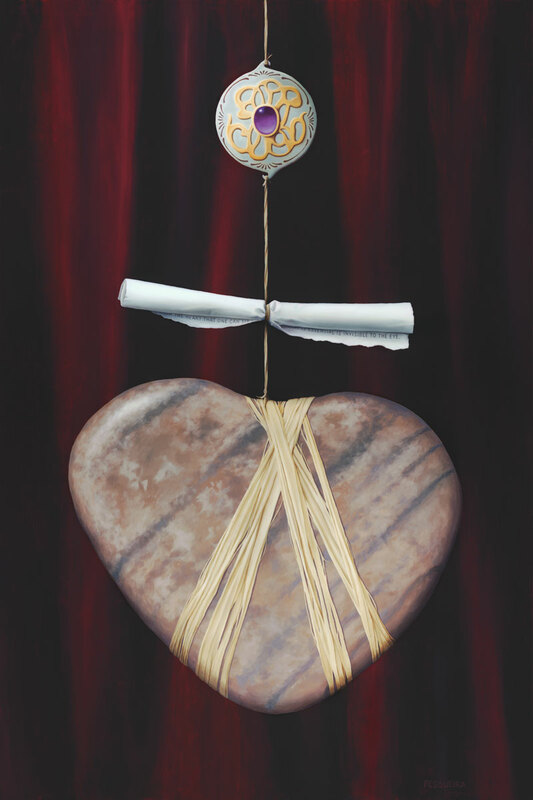 The heart stone – LOVE– holds it all in place, and makes it all worthwhile.